A more expensive home probably enjoys a better location and amenities, but costlier renovation does not necessarily mean better interior design. With a good interior designer, some creativity and an open mind, you can do up a stunning home for under $60,000. Not convinced? Here are six notable condominiums that have done it without breaking the bank. 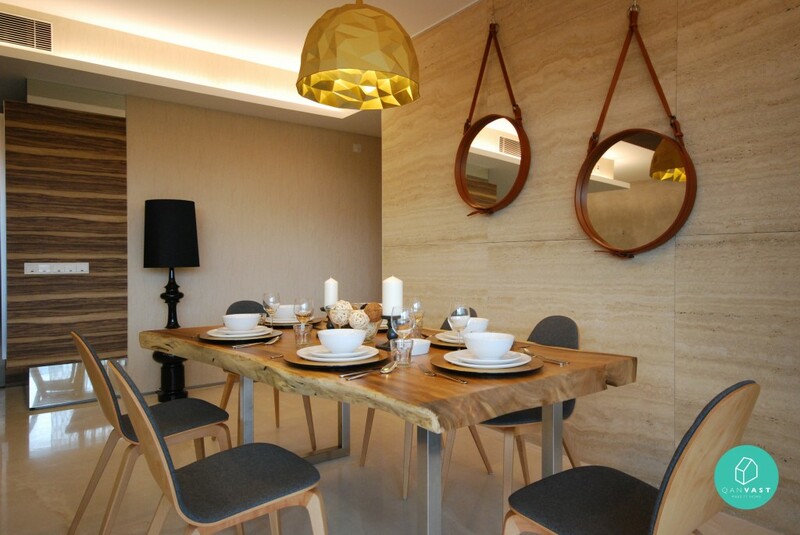 The homeowners achieved a back-to-nature feel by keeping the home minimalistic with earthy tones and raw touches. It could have easily become lifeless and uninspiring, if not for the modern art décor against the simple yet classic wallpaper. What they wound up with was a homely space that’s stylish and interesting. The industrial theme is all the rage right now. Instead of steering away from it, make it your own by injecting some unexpected elements. 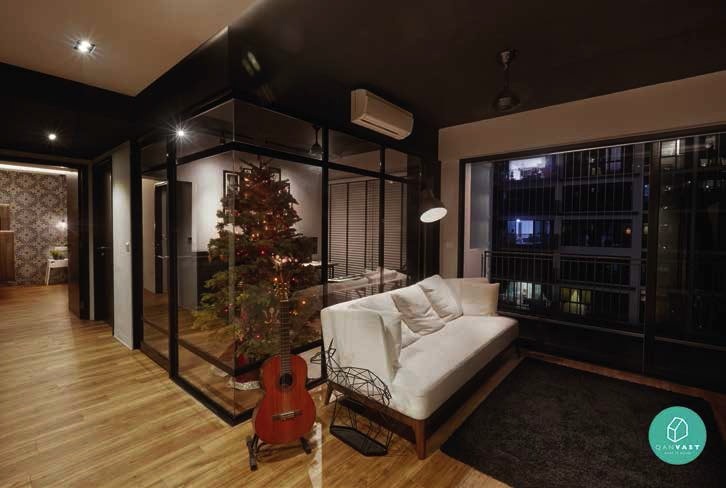 This homeowner did just that by turning one of the bedrooms into an open-concept music room through the use of glass panels,as well as vintage wall tiles in the master bedroom. What a way to make a striking first impression. This condo’s stained plywood ceiling feature is truly one of a kind, and helps to elongate the entrance walkway. 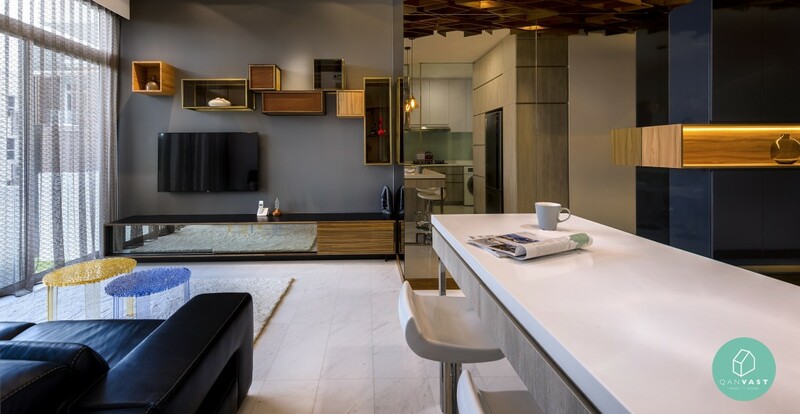 The homeowners also chose a mix of dark and light finishing to develop a bright and warm living environment. The Scandinavian style usually does best in a spacious home, due to its bright, airy characteristics. The homeowners have stayed true to the theme in the living and dining area, the light colours giving it a refreshing look and the clean lines maximizing its space. This industrial home is bursting with character. It’s hard to take life too seriously when you are surrounded by fun and quirky décor. 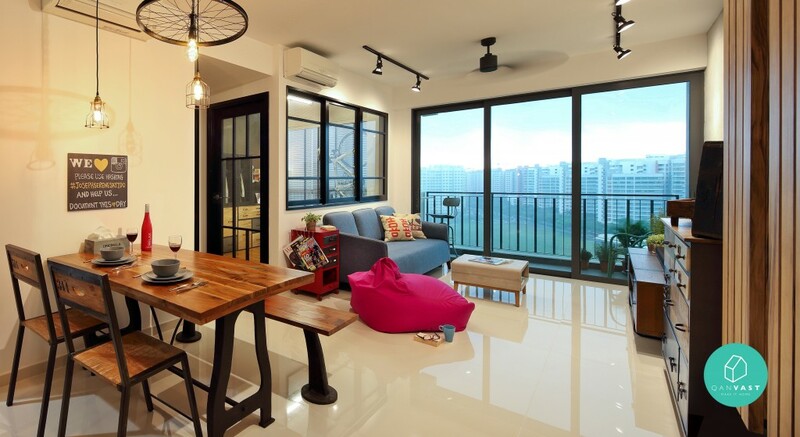 The homeowners showcased their creativity in many of their decorative elements, such as the bicycle wheel suspended from a hanging ceiling light, and touches of red amid an otherwise monochromatic colour scheme. It’s not easy to find new homes that adopt a traditional style these days. But this one has set a good example by going traditional with taste and poise. We especially like how the space is elevated with the richness of quality wood and beautiful art pieces. Article and images provided by Qanvast. Qanvast can connect you with trusted interior designers that match your renovation preferences.Hear the stories from our homeowners who used Qanvast to do up their dream home.